According to billingsgazette.net, fans will soon see a lot of Indiana Jones promotional artwork coming from Russell Walks, an artist who Star Wars fans may recognize from the Star Wars Celebration Art Shows and the Topps Galaxy trading card series. For Indy, it looks like Walks will be illustrating for Dr. Pepper, Kellogg’s, and others. His work for the film includes a life-size cardboard standee of Harrison Ford as Indiana Jones – yes, the one featuring an expression with “slight undertones of happiness.” Using promotional shots provided by LucasFilm and poses from members of his fan base, Walks created the piece after a little bit of struggle, mostly with those slight undertones. Check out the full story here, and learn more about the artist in starwars.com’s official artist profile. The official poster of the Academy of Motion Picture of Arts and Sciences’ 80th Academy Awards® features the iconic Oscar glowing among bright lights against a black background. Capturing the allure and excitement of the Oscars®, the design was originally conceived by legendary motion picture poster illustrator Drew Struzan and executed by his son, Christian. It appears the poster itself is available for pre-order from the site so if you’re a fan of Struzan’s work, this will definitely be one you’ll want to pick up! 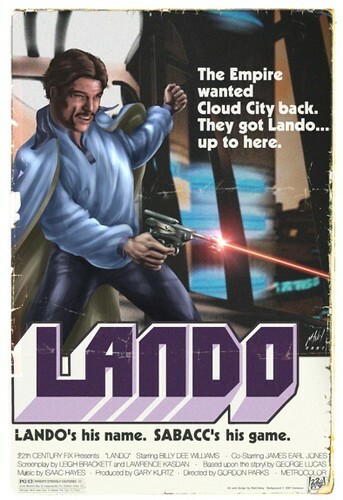 Star Wars artist Matt Haley pays tribute to Lando Calrissian with his take on the classic Shaft movie poster. Bravo. The droid duo show up on a wall in Fremantle, WA. California artist Michael Fleming (AKA Tweedlebop) makes saying your ABCs even more fun with these adorable Star Wars tributes. Sweden-based artist Mattias Adolfsson creates Baroque-style portraits (think wigs and Steampunk gears with a cartoony twist) of Darth Vader, Chewbacca, Princess Leia, Luke Sylkwalker, C-3PO and R2-D2, a stormtrooper, and even the Death Star and the AT-AT! Starship Modeler recently hosted a contest that asked contestants to submit their best model “wreck” — that is, any model that might be defined as“derelict, broken, abandonned, war-weary, busted, beat up, junker, hangar queen, crashed, pranged, in disrepair, poorly maintained and held-together-with-baling-wire-and-prayers”, etc. Scratch modeler Dimitri Kaliviotis took home the first place prize with his stunning 1/32 scale AT-AT, which truly looks like something post-apocalyptic from that galaxy far, far way. Check out the rest of the entries for more Star Wars-inspired wrecks. You are currently browsing the archives for the Star Wars Art category.